Bunnies are pretty popular at our house right now. We even did a bunch of bunny themed crafts and activities. Over the past few weeks we've been sharing Easter craft and activity ideas over on Instagram as part of our A Very Toddler Easter 12 day series. Today I'm sharing a cute and colorful Easter bunny puppet craft that I made with my toddler. My toddler made the activity look like so much fun that my preschooler decided to join in as well! To prep ahead for this I cut out bunny ears from brown paper for each bunny and then I also cut out a nose for each bunny. The kiddos decorated the brown bag and ears with do-a-dot markers and then they glued on the eyes, nose, and ears. I wrote on whiskers for any of the kiddos that wanted them using a black marker. Once their bunnies were decorated and dry it was time for a puppet show! The bunnies turned out great and looked so cute! 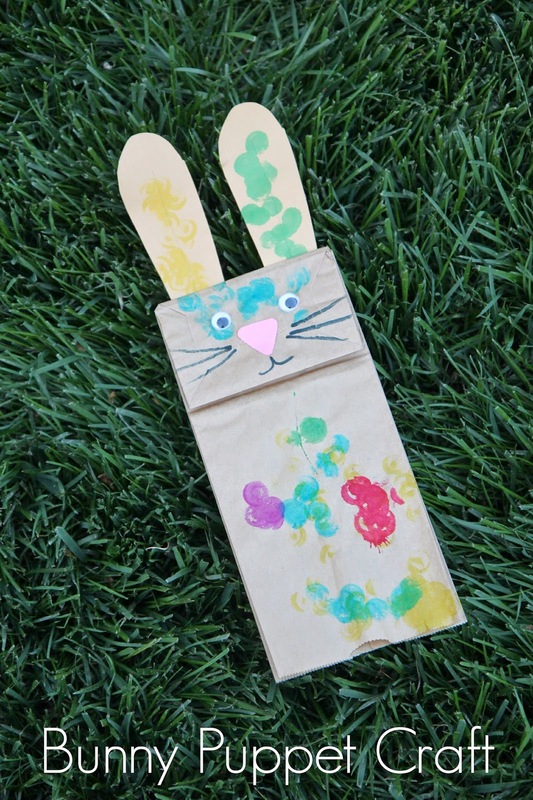 Have you ever made paper bag bunnies for Easter? Tell me about it! I'd love to hear some other alternatives or variations on this project. Also, if you're looking for some last minute Easter ideas... don't worry we've got you covered. Go Here for our 20 favorite last minute Easter activities for kids.